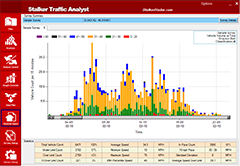 Collect traffic speed and volume data, and analyze traffic statistics from Stalker Radar. Updated analysis controls allow the user to take raw data and display it by count vs time, count vs speed, and 85th percentile, just to name a few. Data can be split, graphed, filtered, and then rendered in a color report designed with Agency Branding and support information. 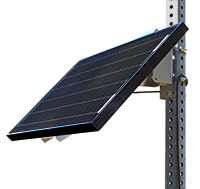 Optional Solar Power Kit - NEW Allows the TDC to operate indefinitely as long as it receives minimum required sunlight. Range of up to 800 ft. The TDC is designed to operate unattended 24 hours a day on battery power alone for a period of 7 days. With the optional Solar Power Kit installed however, the TDC can operate indefinitely as long as it receives the minimum required average sunlight. If the TDC battery were to become fully discharged, all existing data is preserved and the optional Solar Power Kit can fully recharge the TDC battery in as little as 12 hours of direct sunlight. Once the battery has been recharged, the TDC continues normal operation without the need for operator intervention. 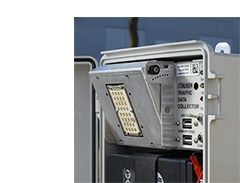 When the survey period is complete, data can be downloaded by either connecting a PC or by attaching a USB memory stick to the Traffic Data Collector’s USB port. Data is automatically transferred to the memory stick without user action. Stalker’s Traffic Analyst application presents data in such a way that makes the survey analysis results clearly understandable. Analysis Control, Graphic Controls, and Data Filtering floating palettes surround the visual analysis window. Changes made to parameters update in real time. Stalker Radar’s Traffic Data Collector gathers traffic statistics to help support grant applications or community policing measures. 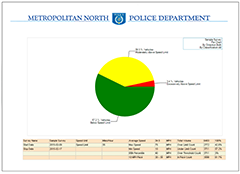 PLANO, Texas (Feb. 19) – Stalker Radar’s Traffic Data Collector gathers real-world traffic statistics that help support a department’s grant applications or verify neighborhood traffic patterns for community policing measures. 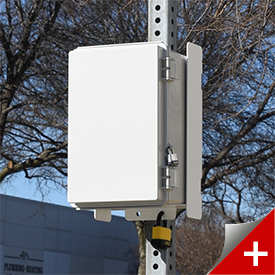 Stalker Radar’s Traffic Data Collector can begin collecting traffic data as soon as it is deployed. Simply secure it to its locking mounting bracket, aim the tiltable radar antenna, and turn it on. 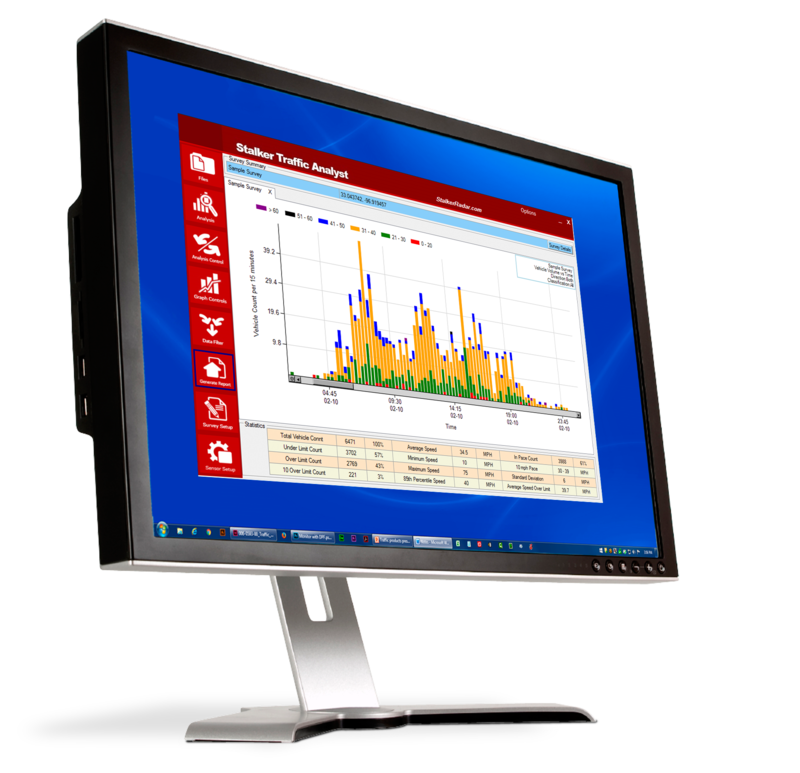 With a 7-day battery life, the Traffic Data Collector captures vehicle data that can be analyzed later with Stalker’s full-featured, easy-to-use Traffic Statistics App, included with every collector. Stalker’s Traffic Analyst application presents data in a 2-axis graphing window that makes the survey analysis results clearly understandable. 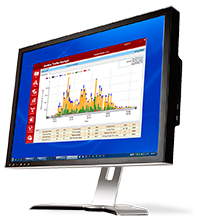 Traffic Statistics, Survey Description, and Display Controls surround the graphing window. Changes made to parameters update the graphing window in real time. NHTSA free flow formatting, including 10 mph pace, 10 mph pace (+), 85th percentile, and average speed are shown in the Speed/Time and Count/Speed views, while a Count/Time comparison is also available. Speed resolution ranges from 1 mph to 20 mph. Time resolution goes from 1 minute to 1 hour. Five vehicle classifications are available as well as monitoring either traffic closing or moving away, or both directions simultaneously. 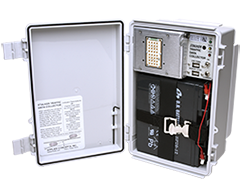 The Traffic Data Collector is housed in a small, stealthy looking, waterproof IP65 box with no exterior markings or stickers. 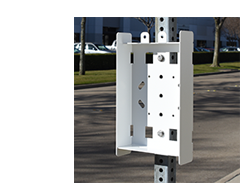 It’s also portable, employing a two-piece lockable mounting bracket that makes it easy to detach, move to another location, and reattach. When the Traffic Data Collector is set up, there is no need to preload locations, direction, etc. That can be done later when the data is retrieved for analysis. The sensor can be tilted down up to 30 degrees for a more accurate vehicle count and to enhance vehicle classifications. When the survey period is complete, data can be downloaded by either connecting a PC or by attaching a USB memory stick (supplied with the unit) to the USB port. Data is automatically transferred to the memory stick without user action. Once collected, Stalker’s Traffic Analyst provides an easy method for adding location, direction of traffic, weather, etc. Results can be shown as either tabular data or as a chart. Chart formats include: line, column, stacked column, and area. The Traffic Data Collector weighs 7.7 lbs. (3.49 kg) without battery and 21.4 lbs. (9.71 kg) with a typical battery. Dimensions are 12.4” x 8.7” X 5.2” (315 X 221 X 132 mm). Enclosed in a rugged non-descript polycarbonate case, ambient operating temperature ranges from -22° to +122° F (-30° to + 50° C). The radar sensor detects approaching or receding vehicles at a resolution of 1 mph (1 km/h). Typical range is 800 ft. (240 m). The 30° x 32° beam can cover up to three lanes of traffic. Founded in 1977, Stalker Radar designs and manufacturers law enforcement and sports Doppler radar systems that are leaders in their areas, and has leveraged its expertise to create a line of high-performance radar sensors for OEM speed monitoring and control applications.